One of my favorite things about this time of year is that I can eat lots of cranberry dishes. I’ve made a ton over the years on my blog, and a traditional cooked cranberry sauce is still my favorite way to eat them. And when I stumbled upon this Cranberry Sauce recipe with Apples on Pinterest, I couldn’t wait to try it. I know a lot of people don’t like cranberries, because of the tartness. But I love it! I love when it kinda gets you in the back of your cheek and elicits a funny face. In fact over Thanksgiving, we were feeding Tate (my cousin’s 1 1/2 year old) all of our favorite traditional holiday foods. I adore that kid. Not just because he’s the cutest thing ever (not biased at all), but he is going to be a total foodie. He’ll eat anything! When we fed him some of my mom’s cranberry salad and waited to see what he thought, he wrinkled up his nose, said “Ew!” and then proceeded to keep eating it and loved it. Seriously he’s a kiddo after my own heart. Last December I highlighted some of my favorite cranberry dishes I’ve whipped up on my blog over the last 6 years. So if you want some inspiration or to try a new way to eat cranberries, check it out! We didn’t have traditional cooked cranberry sauce for Thanksgiving, so I’ve been craving it a bit. And I was excited to try a variation on it with apples and some cinnamon added in. The apples are Granny Smiths, so they’re still a bit tart, yet they add some extra sweetness to the sauce. 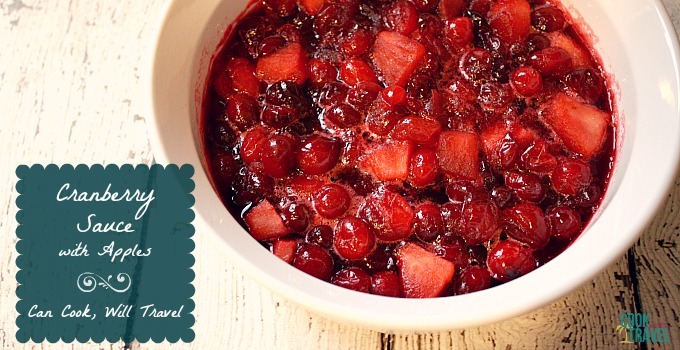 And if you want your home to smell like the holidays, just whip up this cranberry sauce! Who needs a scented candle?! This recipe was a cinch to make, and came together in about 20 minutes with prep time included. 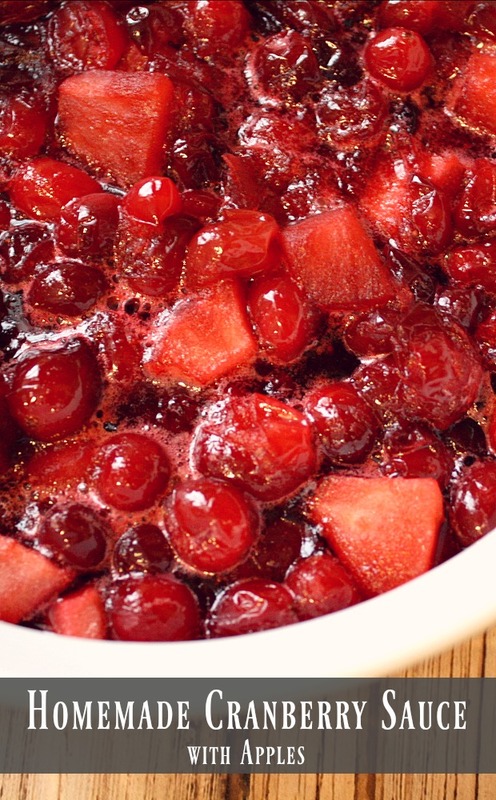 Just wash your cranberries and throw out any soft ones. Then peel a Granny Smith apple and dice it up. Pro note here: Toss your diced apples with some lemon juice to keep them from turning brown. This will let you cut them up ahead of time so they’re ready for you and are still fresh looking. Then in a saucepan, bring water, sugar, cinnamon, and salt to a boil until the sugar has dissolved. Add the cranberries and apples, and simmer and stir the mixture until it thickens up and the cranberries start to pop open. I cooked mine about 10-11 minutes. Then transfer to a dish and let it cool to room temperature and that’s it! You can make this ahead of time, and pop it in the fridge once it’s at room temperature. If you do that, cover it with plastic wrap and press the plastic down to touch the surface of the cranberry sauce. Then the dish won’t form a skin on the top while chilling. I might just try to sneak this dish into our Christmas dinner line up this year. (Mom, you’ve been warned!) It’s super good, and it reminds me of the Apple-Cranberry Pie that I’ve been making at Thanksgiving for a few years now. It’s such a great combo of sweet and tart, that it might just be a great way to get cranberry haters to give this cranberry sauce a chance. 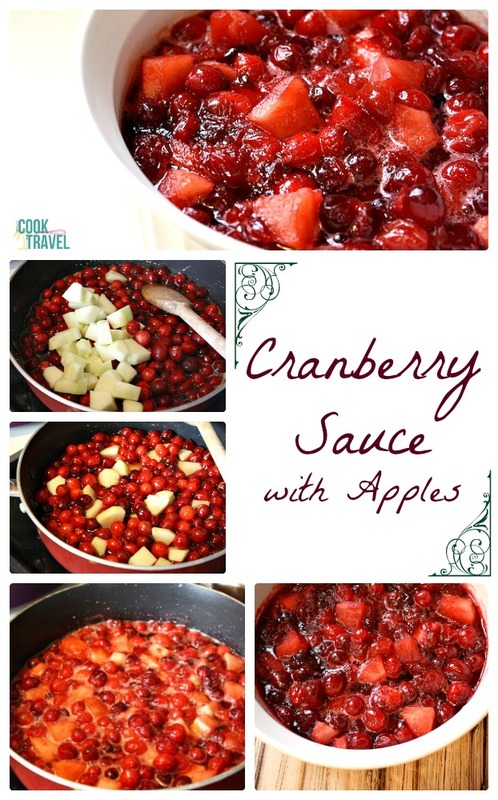 If you’re a big fan of cranberries, then making this Cranberry Sauce with Apples recipe is a MUST! With as many get togethers as we often have during the holidays, showing up with this as a side is a great option! Click that link for the recipe step by step instructions. Happy cranberry eating!! One year ago: Roasted Butternut Squash and Bacon Soup . . . Delicious! Three years ago: Beef and Broccoli – Don’t Mind if I Do! Five years ago: Chicken and Wild Rice Soup that Hits the Spot!